"Art is an empathy machine. Art allows one to look through a fellow human's eyes. That is all I can do." Dave McKean's latest graphic novel, Black Dog: The Dreams of Paul Nash, is another beautiful and visually inventive piece. It's a series of vignettes about Nash, who was a British artist. McKean explores different moments in Nash's life, sometimes in brightly-colored poetry, sometimes taking a grim look at experiences like education and war. There's an especially revealing conversation between Nash and his brother when they're wartime soldiers. They talk about how drawing helps them to cope. I didn't know anything about Nash before reading the book, but McKean makes the subject his own, which is a good thing. McKean's is a multi-media approach. He plays with different visual styles, sometimes overlapping on the same page or in the same panel — ink, paint, collage, pencil. If you've seen his Cages or Celluloid, you'll be prepared for how Black Dog looks, though it still stands unique in the specific uses of those ingredients. There's no else I know of doing what McKean's doing on the visual side of comics. 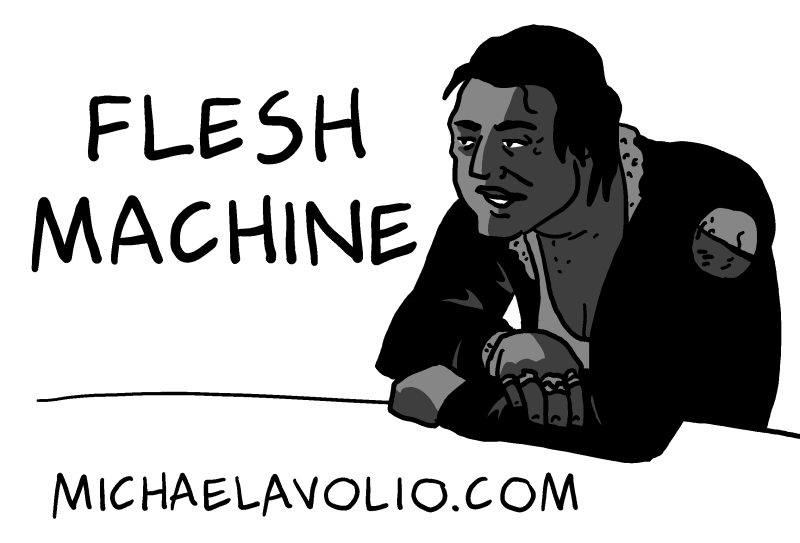 I'm finishing up this week's pages of Flesh Machine, the sci-fi comic I write and draw. I'll post them at michaelavolio.com, where you can read the whole story so far. New readers should start from the beginning. This week, we're meeting another new character — Tsosie! As always, thank you for reading, and special thanks to my Patreon patrons for your support! If you aren't already supporting my comics work via Patreon, you can check it out at patreon.com/michaelavolio — it's an easy way to get involved.